Celebrate at Casa de Bandini or let us cater your at-home fiesta. Join us at Casa de Bandini May 3-5 for several days of strolling mariachis and Folkloric dancers, tasty food, and drink specials! 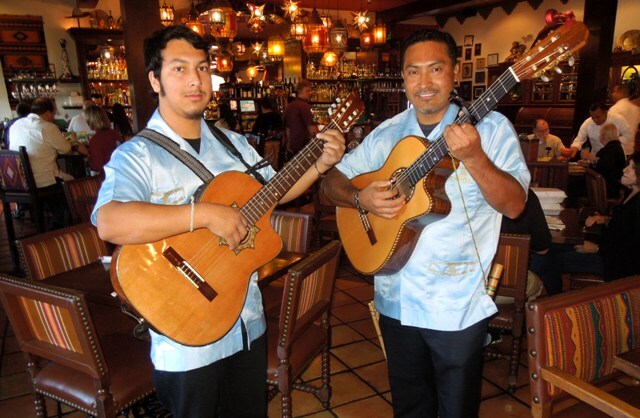 Latin American folk band TINKU will commence three-days of live entertainment Saturday, Sunday and Monday, followed by mariachi performances and Folkloric dancers. Entertainment is from noon to 9 p.m.
Saturday and Sunday, drink specials will include small Azunia margaritas for $7.95 from noon to 2 p.m., Cuervo Bucket of Gold for $5.95 from 2-3 p.m., pints of Dos Equis for $4 from 3-5 p.m., small Don Julio margaritas for $9.95 from 5-7 p.m., and a special late night happy hour from 7-9 p.m. including $1 off draft beers, $2 off wine, $4.50 house margaritas and half-off select appetizers. All day Monday, small house margaritas are $4.50, Dos Equis pints are $4 and Coronito large margaritas are $9.95. Shots Hornitos $5.50, you keep the glass. “Horn” Sauza girls giving away “Cinco”specials, shirts, etc. 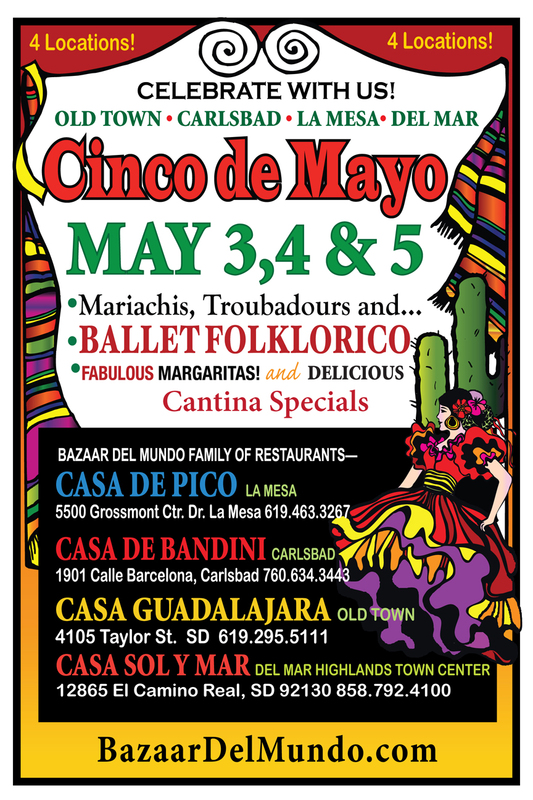 This will be the biggest and best Cinco de Mayo Celebration anywhere in North County. Come early and stay late. Casa de Bandini looks forward to making your celebration the best you’ve ever had! 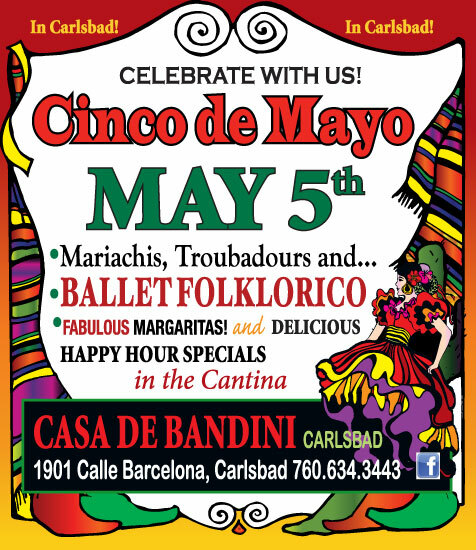 Cinco de Mayo Coming Up Soon – Celebrate at Casa de Bandini!